Finding a place to store your favorite beauty essentials isn’t rocket science. But when you’re racking your brain trying to figure out where to put your giant bottle of body lotion amidst the chaos that is your cluttered bathroom counter, sometimes it feels that way. Instead of giving up and shoving everything you own into a plastic bin below your sink, get creative. Here are 16 awesome and totally doable beauty storage ideas and solutions. 1. 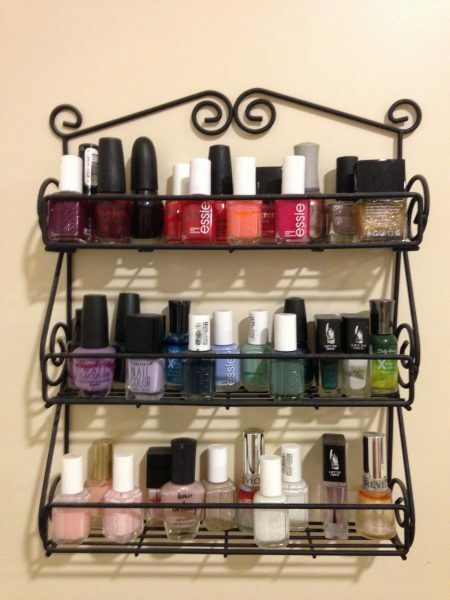 Display nail polish in a spice rack. Store your collection of colorful nail polishes somewhere they can shine. A basic spice rack is perfect for lining up your bottles of polish in neat rows so you can see all the different shades at once. 2. 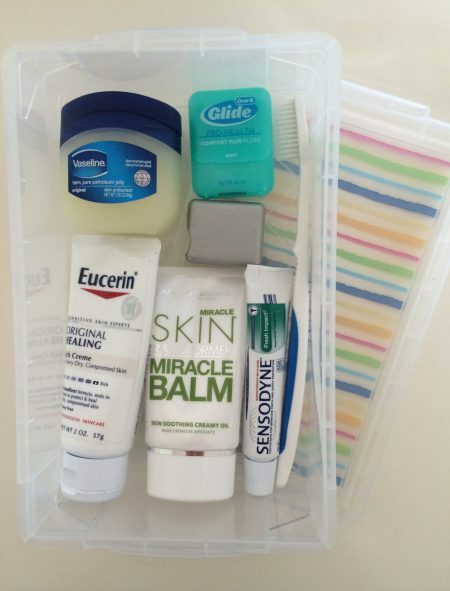 Store toiletries in an old pencil box. 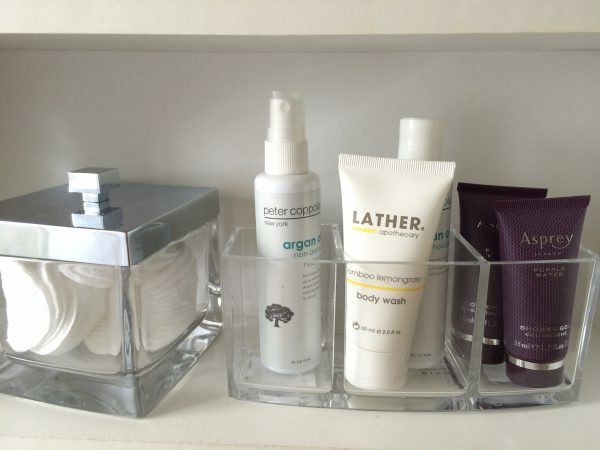 Courtesy of bulk packaging and tempting sales, we’ve all got an extra stick of deodorant or tube of toothpaste (or maybe two or three) cluttering our medicine cabinets and drawers. Instead of letting these items float around willy-nilly in your baskets and bins (the horror! ), store them in a designated box you can hide out of sight. An old pencil case — plastic, metal, or lined in cheetah print — does the trick. Having trouble decluttering your bathroom? 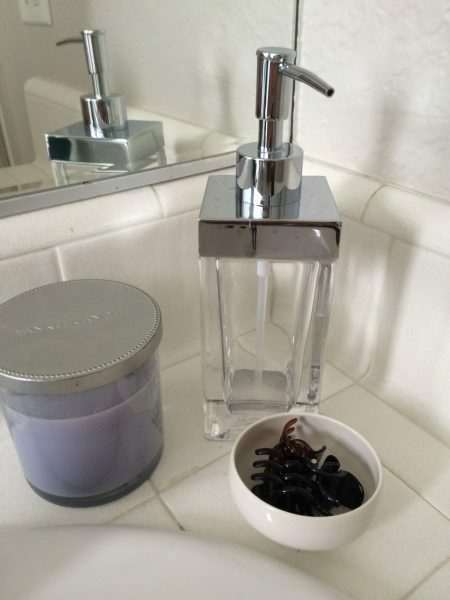 Here are 12 extremely easy ways to declutter your bathroom. 3. 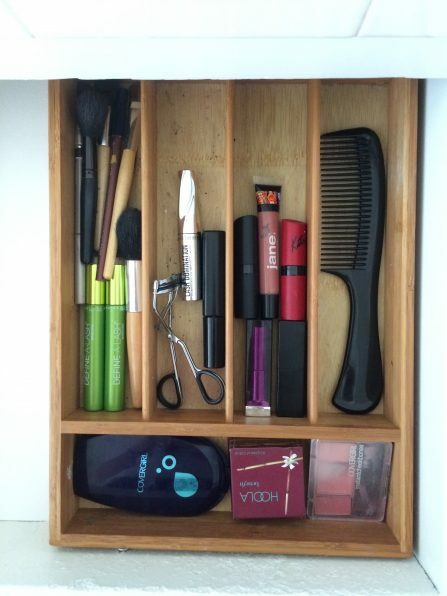 Use drawer dividers to organize cosmetics. 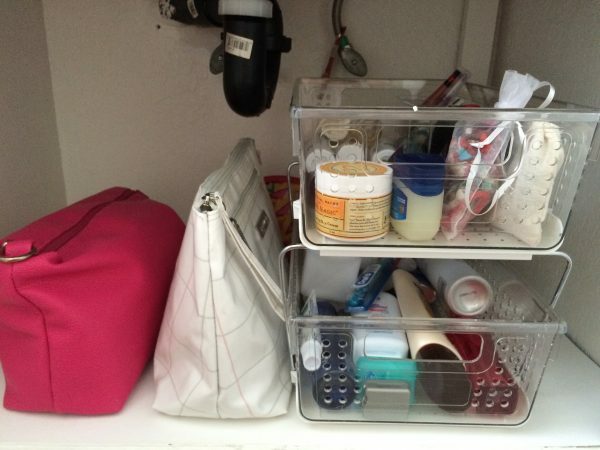 Drawer dividers are the gateway to easy beauty organization. So easy, so obvious, and so impactful. All you have to do is get a divider, then separate your products by type or category and file them away in neat sections. 4. 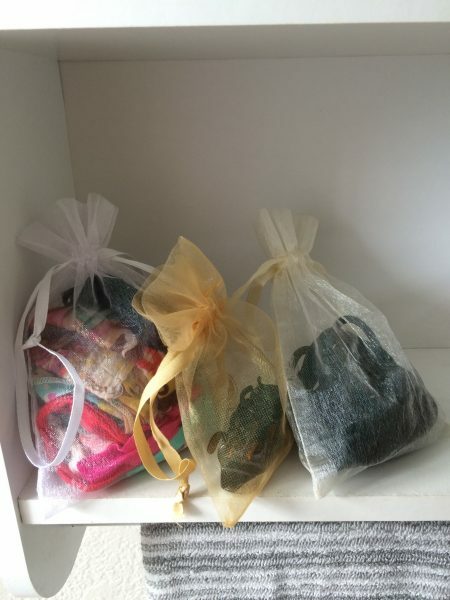 Keep headbands and hair ties in little drawstring bags. Corral all your headbands and hair ties in cute pliable fabric bags. They look charming lined up on an open shelf, but you can hide them away in a drawer just as easily. 5. 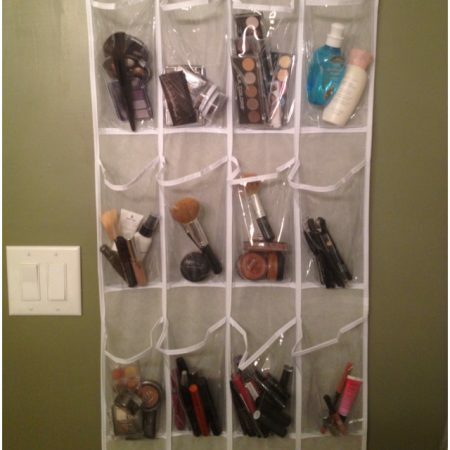 Use a shoe organizer to store beauty products. Who wants to stuff a shoe organizer with dusty trainers and sandy flip flops when you can use it to store your favorite beauty products instead? It holds a multitude of different items. You can easily see and access what you’re looking for. It saves a ton of cabinet and drawer space. Hang it on your towel rack or the back of your bathroom door for a more discreet look. Free Bonus: Check out our full list of 42 bathroom storage hacks and solutions that will upgrade your life. 6. 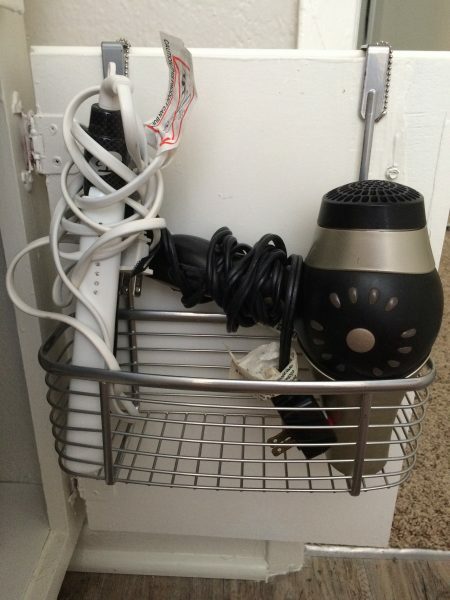 Store your hair dryer and straightener in an over-the-door basket. Forget about leaving your straightener, blow dryer, and curler atop your bathroom counter in a massive tangle of cords.Like a holster for your hair tools, a small over-the-door basket keeps everything organized and easy to grab on the fly. Like a holster for your hair tools, a small over-the-door basket keeps everything organized and easy to grab on the fly. 7. Use Lucite desk organizers to hold lotions. Repurpose the desk organizer that holds all the paperclips and highlighters you never touch into a chic stand for your lotions and creams. 8. 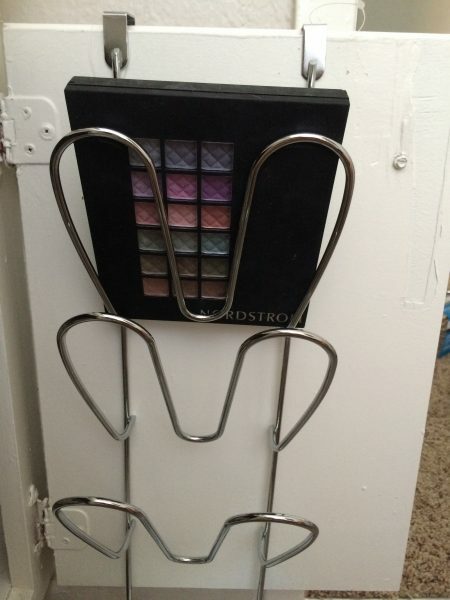 Use a lid rack to store eyeshadow palettes. Who needs an organized kitchen cabinet when you can have a killer makeup display instead? Stack your eyeshadow or lipstick palettes in an old lid rack to keep them out of the way and off your sticky cabinet floor. Free Bonus: Read our guide to storing all your different types of makeup. 9. 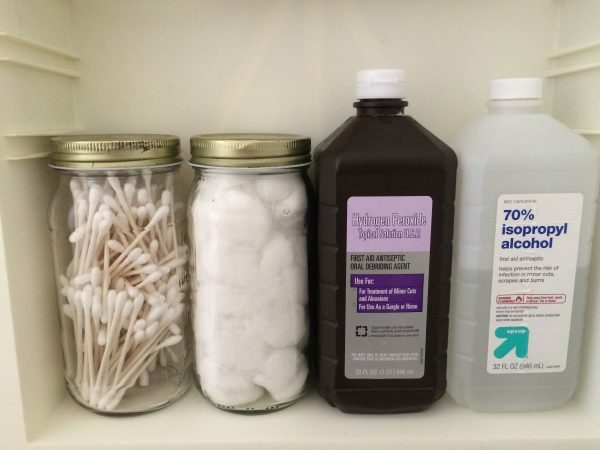 Store cotton balls and Q-tips in Mason jars. Turn your surplus of old measuring or Mason jars into a storage station for your various cotton necessities. The best part? The jars double as cute shelf decor. 10. Use stackable drawers to organize beauty products. For anyone who’s ever been frustrated by the lack of shelving in an under-the-sink cabinet, fret no more. Stackable drawers are your new best friend. 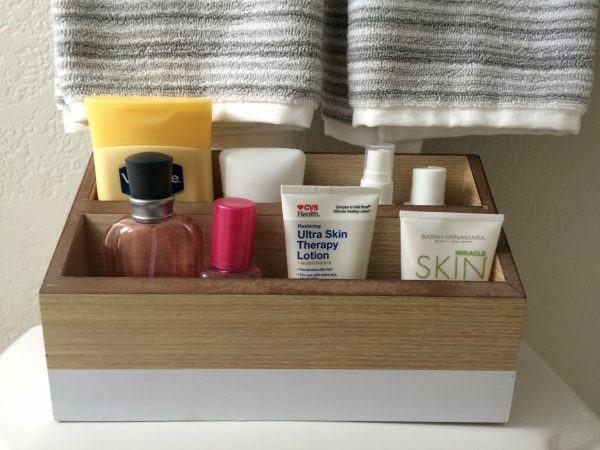 They’re affordable, easy to assemble, and insanely useful when it comes to storing all the random hand lotions and hair gels you’ve accumulated. 11. Store skin creams in a plastic fridge tray. Picture this: It’s a hot, sweaty night and you apply a chilled eye cream to your skin — straight from the fridge. 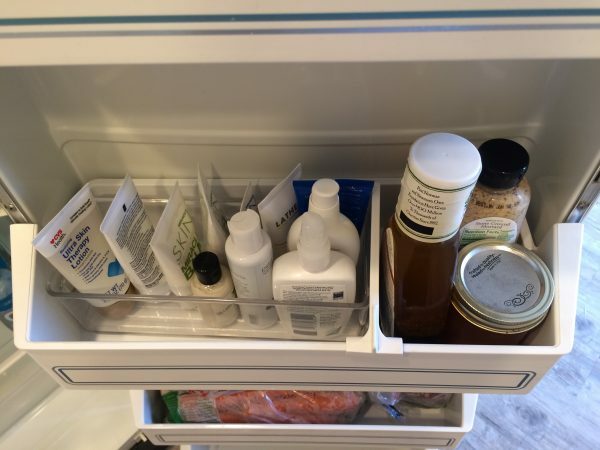 It may sound crazy, but eye creams, serums, lotions, moisturizers, and toners can all be stored in the fridge alongside your eggs and condiments. Besides the fact that these products have a great shelf life in the fridge (pun intended), their cooler temperatures can soothe your skin and reduce puffiness and inflammation. 12. Store hairsprays and bottles in a file holder. Hair products often come in tall or bulky bottles, making them tricky to store inside drawers or atop low shelves. Enter: that decorative fleur-de-lis file holder you still have from tenth grade. Not only is a file holder the ideal size for bottles of hairspray and mousse, it’s totally portable, so when you want to style your hair you’ll have everything you need in one place. 13. 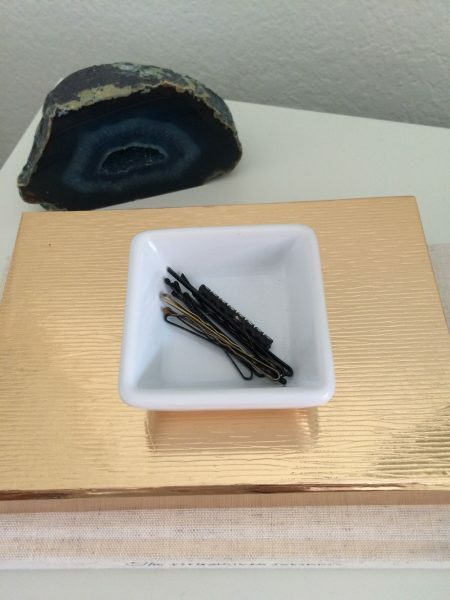 Store bobby pins in soy sauce dishes and hair clips in ring dishes. Keep your collection of prone-to-wander bobby pins and hair clips in little soy sauce dishes or ring trays. They’re easy to store out of sight, but they also look pretty dang adorable sitting on a countertop. 14. Store your most-used beauty products in a desk organizer. Turn a stylish desk organizer made for notebooks and stationery into a stable for your everyday products. The open design makes it a cinch to grab everything you need, so your morning routine can be that much breezier. 15. 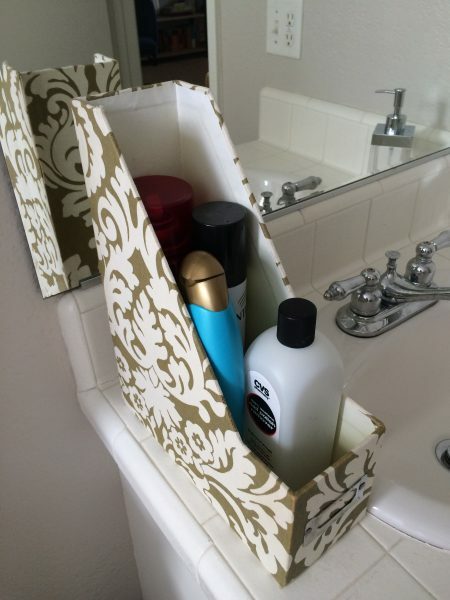 Use a rolling utility cart to organize bathroom products. Sometimes you just want everything in one spot. 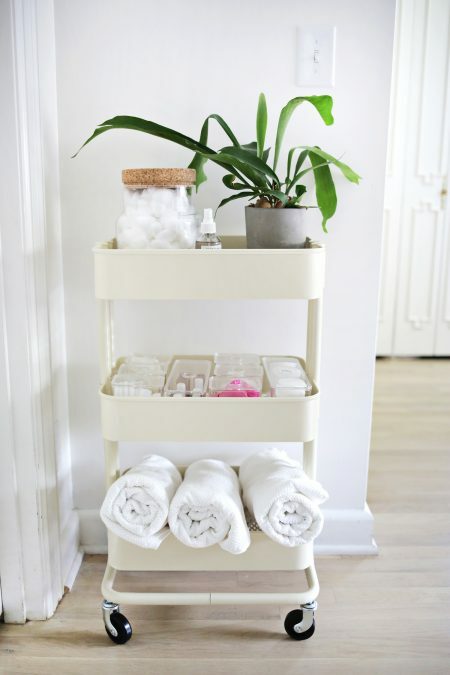 When you have zero cabinet or drawer space left to house your beloved beauty products, a rolling utility cart, such as IKEA’s RÅSKOG or their new SUNNERSTA, is the way to go. Find one that matches your bathroom decor and organize everything in coordinating baskets, boxes, or trays for a look that’s as beautiful as it is functional. 16. Effortlessly store your beauty products in MakeSpace. For everything you can’t fit inside your bathroom — your burgeoning collection of nail polish, the blow dryer you don’t need during summer, or your surplus of shaving cream — use MakeSpace. Simply schedule a pickup and pack your stuff. Then we’ll grab everything from your home and transport it to our secure, temperature-controlled storage facility. And when you want something back from storage, the only thing you have to do is browse your convenient online photo catalog of your stuff and click a button to have it delivered. Simple as that.